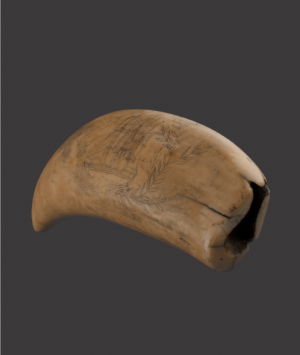 ‘Scrimshaw’, is a word usually employed to describe a distinctive form of maritime folk art prevalent among sailors throughout the 19th century and the term is generally associated with objects produced during this period, applying to both the process of production and the finished work itself. 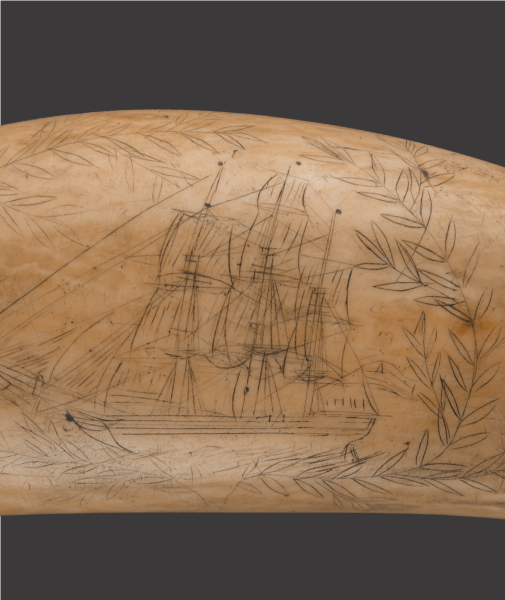 The art form flourished when the whaling industry was at its height, although limited by the materials available, a diverse spectrum of both charmingly naive and beautifully complex works were produced, affirming both the skill and ingenuity of the art’s practitioners and the considerable time spent inactive on board a whaling ship in pursuit of its quarry. A myriad of designs celebrating patriotism, the ship, life at sea, the whales themselves and process of hunting them, feature prominently as popular motifs on many of the decorated objects, however one overriding and overwhelming inspiration, influencing much of what was produced can be tellingly seen, not simply betrayed by the obvious rendering of female likenesses, reoccurring initials and heart designs relating to loved ones but by examining the intended role of the works produced and reading its often deeply symbolic nature, careful study and contemplation revealing a compelling and rather haunting sense of aspiration to return safely home again. In addition to the production of personalised items, special keepsakes and practical gifts intended for family or sweetheart’s, a variety of utilitarian works were also produced, to be perhaps offered for sale or bartered back at port, providing some additional income to the often meagre sailors pay. The most prized material of the ‘Scrimshander’, the dense tooth of the Sperm Whale was selected as the primary choice for producing many of the finest works and components of. 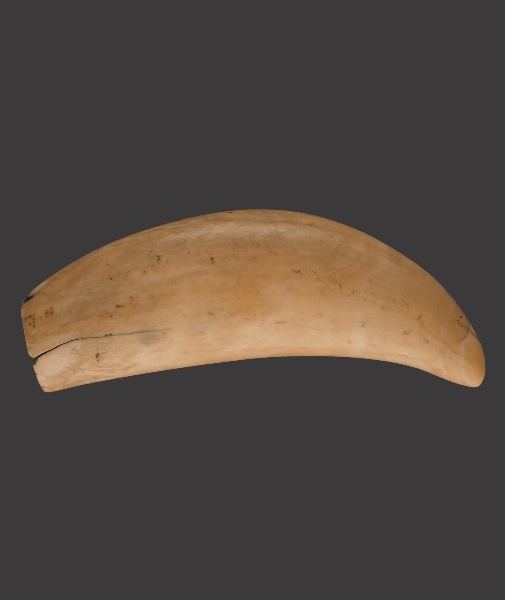 It is perhaps however the teeth which remain in their original form which are the most compelling and instantly recognisable of the works produced. 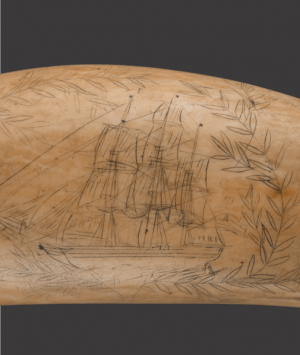 Decorated with scenes and subject matter as various as the level of skill possessed by the carvers, no other single object epitomises the scrimshaw industry better. Those of artistic competence were free to create and perhaps record from, ‘life’, while individuals less gifted could paste a printed paper image sourced from a book to the tooth and carefully prick the outlines, which after removal of the paper allowed them to complete the design with carefully incising, joining the dots. Completed images would be highlighted with whatever was available to hand, ink, paint, tar, soot and even tobacco juice is believed to have been used. 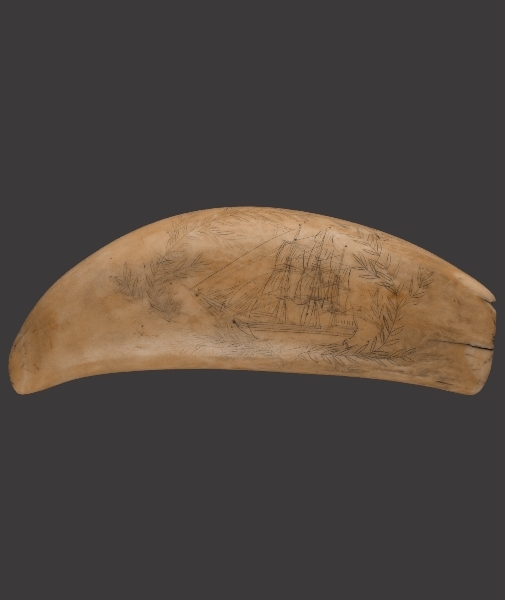 This tooth is decorated with a charming rendition of a three masted ship surrounded by a laurel wreath, an ancient symbol representing honour and victory.